It occurs to me that we, as human beings, are all some combination of light and darkness. The task is to balance the two, without letting either one have the greater power. Too much darkness will engulf us into the depths of fear and depression. Too much light will make us blind. The light is active, warm, affirming and life-giving, but excessive sun will give us sunstroke. The night is silent, contemplative and restorative, but too much darkness will cause inertia. At no time of year are these truths more evident than at Equinox, when light and darkness occupy an equal number of hours in one day. The light and darkness can also be compared to personalities. Somewhere along the line, darkness got a bad rap. This of course, is vastly unfair. It is true that no one likes “morbid Morticia”. She is rude, harsh, abrupt, maybe revealing a bit too much of the cold, hard truth. However, the sugar coated “positive Pollyanna” can grate on our nerves as well. She is too happy. We are jealous. Who lives in a 24 hour sunshine? We want revenge! Can she be for real? Think whatever you want about morbid Morticia, but she has some wicked, hidden secrets to reveal. Are you interested? Of course you are! She is the night, the wisdom, the no-holds-barred exposure of the soul. Positive Pollyanna can keep these harsh truths in perspective. She is the illumination, the goodness and the gentleness, forever reminding us of our light within. We need both of them. There is an ancient Taoist belief that all of nature is a reflection of humanity, and vice-versa. We humans are more like the elements of nature than we might suspect. 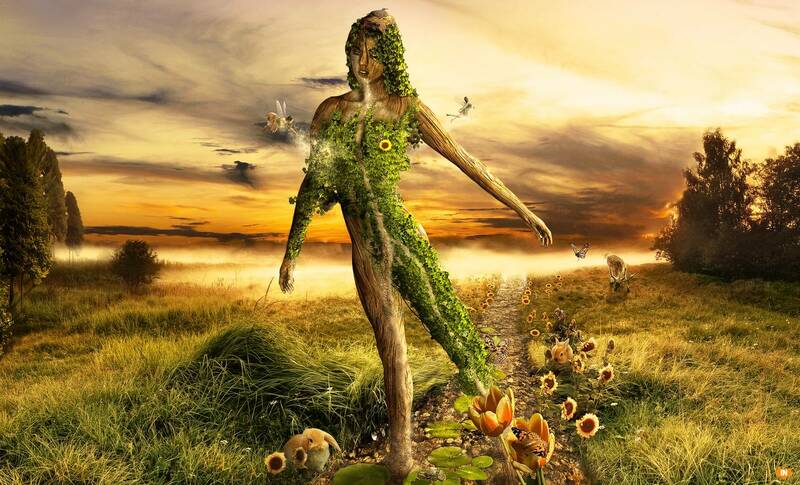 Our life cycles stand parallel to those of plants and flowers, going through the same phases of Maiden, Mother and Crone. Therefore, if we seek to heal anything within ourselves, we need only look to nature for the solution. In the northern hemisphere, we now greet Autumn. We gather our harvest, embrace the last glimpse of summer and prepare for the darkness to come. In the southern hemisphere, we greet Spring. We begin planting, kiss the night goodbye and prepare for the long, fair days to come. Both are important for our well being. Both are important for the well being of our planet. At this Equinox, take some time to reflect on and embrace both the darkness and the light within yourself. Blessed be! Today we see an equality of day and night, yet soon the darkness will overtake us. The earth tilts. Persephone descends to the underworld once again, leaving dead crops and barren fields. This is the time of the dark goddess. Call her Morrigan, Hekate, Hel, Mab, Cerridwen, Lilith. She rules all things subconscious. She is neither mother nor maiden. She is the mighty huntress, the warrior, the crone, the sibyl, the healer, the high priestess. Her wisdom is deep. She invites us to go within, explore shadows, face personal darkness as the long nights scare and tempt us. Autumn’s equinox is the perfect time to begin ritual with the dark goddess. You may find her in the stillness of the forest, in the fading summer twilight or in the harvest moon. She is mysterious, unpredictable. She bids, she beckons, but most of all she haunts. This is the season of death, and in all death lies transformation. For those who dare to explore the dark side, magnanimous gifts await. The dark goddess helps us break through fears, anxieties, phobias. Breathe deep. Take in the essence of autumn — ripe fruits, acorns, crackling fires, candlelight. 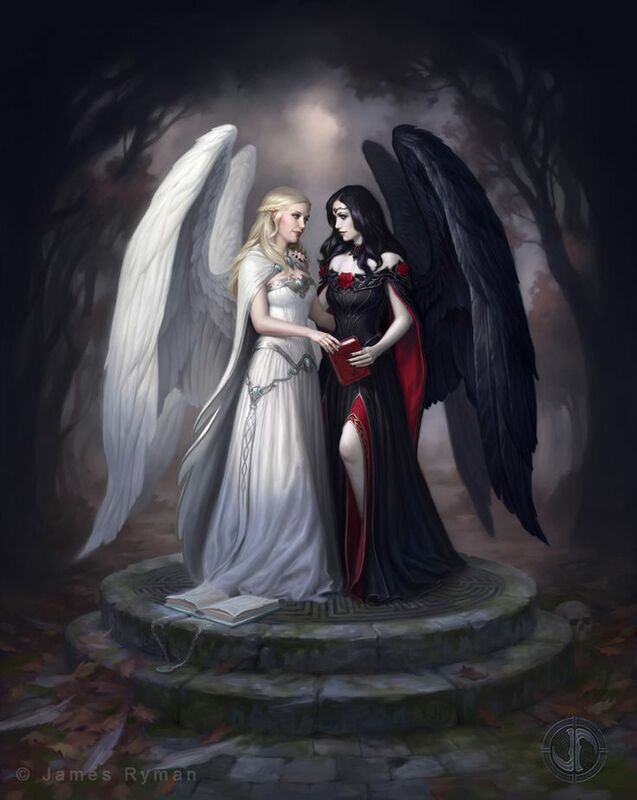 Meet the Morrigan on a raven’s wing or journey with Persephone across the River Styx. Energy is transformed in the scarlet hues of falling leaves as they crumble and return to the earth. Energy is transformed in the foods we eat at harvest. Our bodies regenerate in the long winter’s sleep. Meditate with the goddess and allow her to help transform negative energy for positive purposes. Our doubts and fears can become confidence and strength. Relish the golden days of autumn. Have a Blessed Autumn Equinox! I live in the Midwestern United States. Clearly the Northern Hemisphere. It is definitely autumn here, and lilacs only ever bloom in May. And yet. Here is what I find. Autumn is, by my own hand and bidding, the bleakest of seasons. It is then I make the world wither and die. Would you expect less of me? My beloved daughter Persephone is taken from me once again. She must return to the abode of the dead, forever at the mercy of her husband Hades. And I, the great grain goddess, go into a state of grief, near madness. I make no secret of this. As I suffer, the world around me suffers as well. Leaves drop from their branches, fruit rots on its vines. Fields go barren, animals grow lean with starvation. The sun, once vibrant and gold, flickers intermittently, its warmth sporadic. The days grow shorter, the nights eerie and long. Dank cold sets in, gales of rough winds churning. Soon all the rivers and ponds will freeze with black ice, fish trapped beneath. All things must die. This is my only revenge, to cut sunlight from the world of the living. I blame Hades, of course. It was he, the dark lord, who kidnapped my daughter, making her his child bride. Though he may be ruler of the Underworld, he is not fit for a wife such as she! I still remember that day in the Sicilian fields. My daughter Persephone had been gathering grapes, sweet and purple as heather. How she loved to pluck them! It was her utmost joy. The innocence of childhood still bubbled within her. She knew nothing of the world. She was, as I recall, quite young. Then suddenly, the land gaped open in a hideous crack. I heard a blood curdling shriek as Sir Hades galloped up on his horse, a black stallion. In one fell sweep he scooped up my baby. Down, down, they rode, into the abyss of the earth, mud sputtering. I chased them but Hades’ stallion outran me. Tar lurched as they entered the bowels of hell. I watched, powerless and bereft. The gap of land sealed, trapping them beneath. My beloved Persephone was gone, leaving only the sun dappled fields behind, her basket of grapes tipped over and spilled on the grass. What Hades did to my child in the Underworld, I dare not imagine! The gory details are too hideous for a mother to ponder. I only know that somehow he bribed my girl with pomegranate seeds. Yes bribery! Leave it to a rogue like Hades to concoct a shrewd scheme. Somehow he convinced Persephone to eat a full six seeds, thus binding her to the darkness. Six seeds, ripe and perfect, all ingested by my child. And each of those seeds insured that she could never be fully released from the wretched prison of the Underworld. Yet there were also six seeds left uneaten. Thank the heavens for that. Therefore we reached a compromise, Hades and I. It was agreed that for six months out of the year my child would reside with the dark lord, but for the six remaining months she’d return home to me. To be clear, it was NOT a generous compromise. I objected adamantly. However, my brother Zeus insisted it was the best that could be arranged. And so, it is for this reason I wreak winter’s havoc upon the earth, depriving all living things of food and sustenance. As I suffer, so all must suffer! Today is the autumn equinox and Hades has come to claim her. Thus we are parted, my daughter and I, until springtime. Gentle human, lend me your ear. Has my mother Demeter been bending it with her tales of woe? Has she told you of how, for six long months she will be separated from me, her baby daughter? How today, at autumn’s equinox, I am banished to the Underworld where I must reside with my evil husband until my joyous return in the spring? Oh, I can just hear her, voice whining like a sad violin! Spare me of it! The story she tells could not be further from the truth. The day my lord Hades rescued me from the drab labor of the Sicilian fields was the happiest day of my life. Do you know what I did in those fields? My uncle Zeus forced me to pick grapes. Grapes! To be made into wine for his vast banquets. I toiled for hours in the blazing sun, my hands raw under the vines, my back burnt red-brown. I was no better than a common slave. Oh, how I wished that fruit would wither upon its vine! And then, in further humiliation, I was made to crush the grapes with my own feet, slithering peels wrapped between my toes. When Hades finally rescued me I was nothing but a sad waif, smelling of concord and sugar, purple stains etched in my hands and heels. I still remember, clear as crystal, the day my dark lord came for me. Riding upon his black steed, he emerged like a knight from the red caverns of the earth. Never had I seen a man more stunning, more virile or more handsome! I abandoned my work, craning my neck to get a closer look. My heart raced. I was by then a woman, having reached my eighteenth name day, though my mother still thought me a child. Hades said nothing to me, all communication smoldered within his eyes. I understood. When he extended his hand I knew my life would be changed in that instant. My lord Hades was the kindest, gentlest of all the gods, and when he asked me to become his bride I did not hesitate for one moment. He offered me a pomegranate which I eagerly bit into, pink succulence twirling on my tongue. Hades then cautioned me about eating the seeds. He advised I leave some behind on the table, so that I could still be permitted to return to earth if I chose. His manner was so humble, his voice so true. I could not refuse him. Nor could I be responsible for the starvation of humankind and their beloved animals! And so I spat out six pomegranate seeds, lining them up neatly upon Hades’ table. He nodded solemnly. “An agreement will be reached,” he assured me. My dark lord and I were married that day on the shores of the River Styx, Charon and Cerberus presiding. With no reservations I pledged myself to Hades, his eternal bride. Because of the agreement, every year at the vernal equinox I must return to the land of the living. I visit Demeter for six months. During this time she makes the earth rich with wheat and barley, apples, grapes, even pomegranates, and all manner of fruits and vegetables. The sun beats down upon us and the rivers run cool. By summer’s end the fields are tired, overwrought from their busy production. The land needs a rest, and I too need a rest from my mother’s over-protection and my uncle’s stern hand. When the autumn equinox arrives it is the most glorious of all days! The earth brandishes its jewels, landscape scattered with ruby leaves. The sun lowers to golden haze and the temperature grows cool. It is then the cavern of the Underworld opens and Hades greets me once again. I then return to my true home, where I rule in splendor for six months. In the Underworld servants dote on me and Orpheus serenades with his lyre. Charon brings his passengers, the newly dead, to the shores of our river. There I greet them with joy, welcoming them to our abode. I am respected and loved. Best of all, my uncle Zeus can never make me crush grapes again! However, I am unhappy with this bothersome six month contract. I vow to dismantle it! Sometime in the 21st century I plan to present my case to the Council of Olympus. The weather upon planet earth will then became chaotic. Winter will seem as summer and vice versa. Tornadoes and hurricanes will wreak havoc upon the land. There will be tsunamis, earthquakes and blizzards, causing much destruction. I must warn you, gentle human, do not to be alarmed. There is no warming of your globe, nor have you brought this inclement weather upon yourselves. It is only me and my lord Hades, attempting to bargain with Demeter. Hot tempered, she shall take her vengeance out on the earth. But fear not. When I renegotiate my contract all will be well. The earth shall be restored, replenished and free of chaos. It is then my mother Demeter and my Uncle Zeus will finally release their hold upon me. It is then I’ll take my true and rightful place where I will live in bliss, year long, by my husband’s side. As above, so below. The world shall be at peace and so shall I.